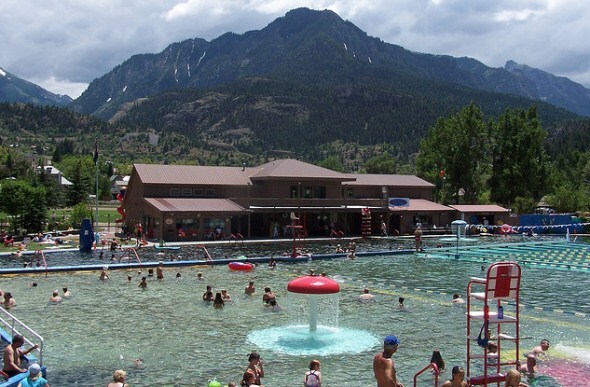 The Ouray Hot Springs Pool, which opened in 1926 and is listed in the National Register of Historic Places, features hot mineral water from seven natural springs that lack the strong sulfur odor typical of hot springs. The water emerges from the ground at 150 degrees but is cooled for the pool, which has seven sections with different temperatures – 104 degrees for the hot section, 95 degrees for the soaking section, and 80 degrees for the lap lanes and deep section in the summer. The outdoor pool is open year-round. In the winter, clouds of steam rise from the pool’s surface as daytime temperatures typically reach only into the upper 30s, and the water temperatures in the pool’s lap lanes and deep section run several degrees cooler. Hot springs in the Ouray area were used for healing by the Ute tribe as early as the 1300s and for recreation and healing by white miners and settlers who arrived in the 1880s.